Northern Virginia is moving towards China, at the same speed your fingernails and hair is growing. The North American continent is drifting towards the Eurasian continent at about one inch every year. Next time you lie down in bed, note the distance between your head and toes... because that's roughly how much closer the continents will get in your lifetime. How did the rocks of Northern Virginia get here, and why are they headed west towards China? That continental drift has been underway for over 200 million years. Everything you see today as "solid earth" has moved, and all the solid rocks you see today were once in a different place. Today the rivers run in channels that are relatively recent. The Potomac River did not cut through the Blue Ridge at Harpers Ferry until 5 million years ago. The Chesapeake Bay as we know it developed in just the last 10,000 years. As the Atlantic Ocean sea level has risen, salt water flooded the Susquehanna River (including tributaries such as the Potomac River), plus the James River. Floods in stream valleys deposit sediments temporarily on floodplains, but later storms will erode those sediments back into the streams. Northern Virginia is getting flatter and flatter, as well as lower and lower after each storm. The Blue Ridge was once the "roots" of an ancient mountain chain, and have been broken loose from where they formed originally. The mountains were shoved, perhaps 40 miles to the west into their current location, when Africa collided with North America about 200 million years ago. Volcanic (igneous) rocks were injected into sediments in the basin between Centreville/Manassas and the Blue Ridge. The injected black volcanic rocks are much harder than the red sandstone layers in the basin. The hot igneous rock baked some of the adjacent sediment into hard "hornfels," in the same way that clay gets harder when baked into pots in a kiln. After Africa and North America collided, the massive continent of Pangea split apart. A crack in the earth's surface formed east of the Blue Ridge - and ended up becoming the current basin between the Blue Ridge and Centreville/Manassas. That basin filled up with sandy sediments eroded from the land on either side. In addition, in the basin jets of volcanic lava spurted from below. The igneous intrusions cooled into hard diabase, very similar to the basalt that forms the floor of the modern Atlantic Ocean. The diabase or "traprock" being quarried for construction now is valuable in quantity, but expensive to transport. 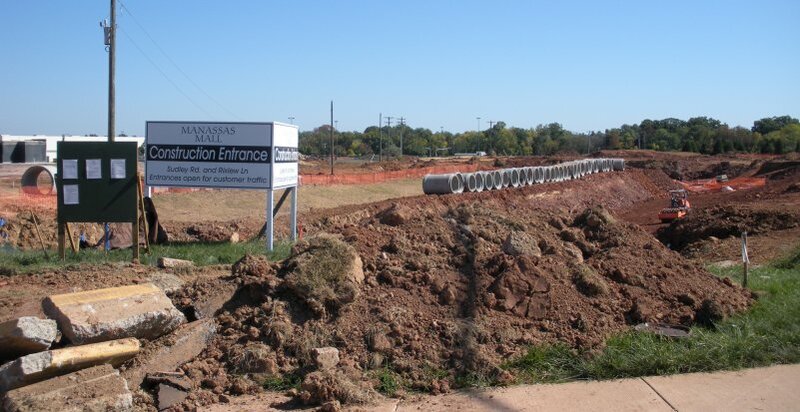 It is smart economics to locate quarries near areas of development, but houses end up being built nearby and then the neighbors complain about quarry noise and truck traffic. The rocks between Centreville/Manassas and I-95 were originally ocean sediments, underwater at the base of a chain of offshore islands (similar to the way modern Japan is offshore from China). Like the Blue Ridge, the Piedmont rocks were also shoved into place by the continental collision between Africa/North America. The flat land east of I-95 consists of sediments that (mostly) eroded off the Appalachians over the last 200+ million years. When you walk on a beach along the Potomac River, you're hiking on the debris from old mountains. Northern Virginia sediments are rich in quartz and feldspar, which slowly change into the red clay that provides our bricks. Northern Virginia lacks large areas of limestone, so we have only two natural caves (in a Triassic-era limestone deposit in Loudoun County). If you define Northern Virginia to include Fauquier and Loudoun counties, then the Blue Ridge mountains forms the western edge of the region. The core of the Blue Ridge is a granite that is over 1 billion years old. That billion-year old rock is coated by a 600-million year old layer of lava. As you drive east from the Shenandoah Valley on I-66 through Fauquier County, all the outcrops of bedrock in the pastures will be the 600-million year old dark lava. At Thoroughfare Gap, still headed east on I-66, you enter one of the Triassic Period basins in the Piedmont physiographic province. That basin formed when Africa and North America cracked apart, and the Atlantic Ocean developed between the continents. As North America and Africa pulled away from each other, the crust of the earth stretched and cracked. One fault formed at the edge of the Blue Ridge, and there the land dropped down like a trap door with the hinge at Centreville. Today, there is an obvious valley between Thoroughfare Gap and Centreville that marks the location of the Culpeper (or Manassas) basin. The basin filled with sands and other sediments so rich in oxidized iron that they are distinctively purple when exposed at modern construction sites. At places, the purple sandstones are interrupted by black volcanic rock that rose up (as the crust on the surface thinned and cracks widened) from the molten magma below. 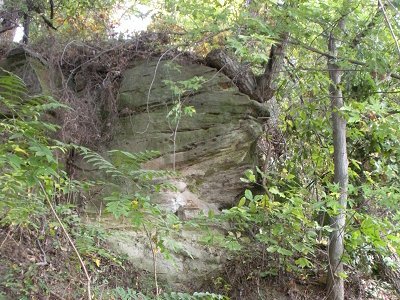 Nearly all quarries in the Piedmont province are located where the volcanic rock (diabase or "traprock") is exposed. The purplish sandstone is too soft for use in road construction, but the hard volcanic rock is highly valued for use in roads, building foundations, concrete, and other construction materials. East of Centreville to Interstate 95, you will cross a different segment of the Piedmont physiographic province. Here, construction projects will expose orange/yellow bedrock that is easily broken up by bulldozers without requiring any blasting. On the eastern edge of this province, waterfalls are exposed where rivers have etched through the weathered "saprolite" to a hard bedrock. A series of waterfalls between Baltimore (Maryland) to Augusta (Georgia) is known as the Fall Line; Georgetown, Occoquan, and Fredericksburg mark the location of the Fall Line in Northern Virginia. The bedrock at Great Falls was exposed about 30,000 years ago, when Ice Age erosion stripped off the overlying materials. This portion of the Piedmont, now far from the Atlantic Ocean shoreline, was once a series of ocean sediment layers. The sediments ended up buried deep under a chain (arc) of islands off the coastline of Virginia, and then were "smushed" against the Blue Ridge when continents collided about 400-200 million years ago. In that process, the sediments were metamorphosed by the weight of miles of overlying rock. 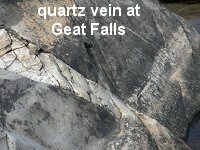 Distinctive minerals formed under heat and pressure indicate the rock now exposed at Great Falls was 15 miles deep underground. Further east in Mather Gorge, downstream near the mouth of Difficult Run, the rock was buried about 20 miles deep and almost melted completely. Near Interstate 95 and eastward to the Atlantic Ocean is the Coastal Plain physiographic province. It consists of sediments that eroded off the Appalachian Mountains, plus a few marine deposits when sea levels were so high that the Atlantic Ocean shoreline was roughly the location of I-95. Those eroded sediments from the mountains were deposited east of the modern Blue Ridge, but the western edge of the deposits (between I-95 and the Blue Ridge) has been washed away again. Today, we see only the sediments deposited/re-deposited on the current Coastal Plain since the Cretaceous Period, 145 million years ago. Those sedimentary layers are still horizontal because there have been no continental collisions to push them up on their side, since North America and Africa began to drift apart. 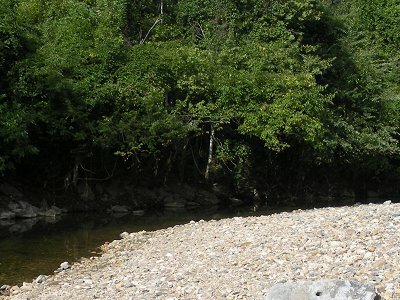 In the soft sediments at the edge of the Piedmont and Coastal Plain physiographic provinces, the erosive energy of the rivers is able to carve deep, so hard Piedmont rocks are exposed as the bedrock forming a line of waterfalls at the eastern edge of the Piedmont/western edge of the Coastal Plain. Sediments now exposed at the top of the Coastal Plain were never buried deep, so the sand and gravel is only loosely consolidated into rock. Today, gravel pits along the Rappahannock River downstream of Fredericksburg supply aggregate and sand for concrete and asphalt used in local construction projects. In Stafford County, the soft Aquia sandstone at Governor's Island was quarried in the 1790's to use as building stone in the Capital and President's House now known as the White House, after the stone was painted to help prevent the soft stone from decaying. 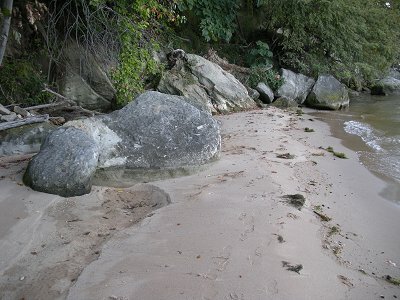 At what is now Leesylvania State Park, sandstone was so easy to carve from the cliffs that the area became known as Freestone Point. Northern Virginia, like the rest of the planet, condensed into a planet about 4.5 billion years ago. As the earth cooled, most of the heavy elements such as iron and nickel sank to the center of the planet, leaving lighter elements such as silicon and calcium in a crust near the surface. Below the crust is the hot "mantle" rock, occupying the space between the crust at the surface and the iron/nickel core of the earth at the center. The crust (called "lithosphere," if you prefer multisyllabic words) is formed of lighter elements than the mantle, and the elements in the crust are not mixed evenly. About 5% of the crust is still iron - it did not all sink to the center. Some rocks on the crust have lots of iron, other rocks are rich in calcium and poor in iron, and yet other rocks are have lots of silica but little calcium or iron. Mineral composition of bedrock has a strong effect (together with climate) on what vegetation will grow at a particular location. Mines are usually located where a certain mineral is concentrated, and a zone of gold-bearing quartz is located between Montgomery County (Maryland) and Orange County (Virginia). Monroe Park at Goldvein (Fauquier County) commemorates the heritage of gold mining in Northern Virginia. The crust is broken into a dozen or so different plates, which can include both ocean and continental crust. Northern Virginia is near the eastern edge of the continent, but sits in the middle of the North American Plate. That plate stretches from the Mid-Atlantic Ridge in the middle of the Atlantic Ocean to the edge of the Pacific Ocean on the West Coast. Magma still erupts/oozes from the mantle and reaches the surface of the earth at "spreading centers" that form ocean ridges. At those ridges the magma cools into solid rock, and becomes oceanic crust (rich in iron/magnesium, but also including plenty of silica). The cooled crust is pushed away from the ridge as more magma emerges at the spreading center, widening the Atlantic Ocean and forming more ocean basalt seafloor (part of the "lithosphere"). In the process, the new rock emerging at the Mid-Atlantic Ridge is forcing Virginia towards China. In 75 million or so years... watch out. The basalt that forms the floor of the Atlantic Ocean, from the east coast of Maryland/Virginia to the coastline of France/Spain, is not all the same age. That ocean bottom basalt just east of Ocean City, Maryland solidified into its current form about 150-200 million years ago. The ocean bottom basalt at the Mid-Atlantic Ridge, at the eastern edge of the North American Plate, could have cooled just minutes ago. Why the age difference? Molten, iron-rich basaltic rock is emerging (from perhaps as far down as the mantle) at the Mid-Atlantic Ridge, where it solidifies. As more molten rock emerges from the crack in the ocean floor, the recently-cooled solid rock is pushed to the side. The engine pushing Northern Virginia towards China is the push from the Mid-Atlantic Ridge. Most of the Mid-Atlantic Ridge is under the surface of the Atlantic Ocean, but Iceland straddles the ridge. The western part of Iceland is part of the North American Plate, while the eastern half is part of the plate with Europe. In the middle of Iceland is the Mid-Atlantic Ridge. The geothermal heating systems of that country tap into the same heat source that is pushing Northern Virginia towards China, and driving continental plates to drift all over the earth. When ocean plates collide, one is pushed down ("subducted") into the deeper mantle. When a plate of ocean rock runs into a plate of continental rock, the heavier oceanic crust (with a higher percentage of iron/magnesium) is typically pushed underneath the lighter continental plate. After the edge of the ocean crust is pushed deep, it melts. Hot liquid magma from melted crust often rises up to erupt in a chain of volcanoes, such as the Cascade Mountains in western Oregon/Washington. Lighter minerals such as silica (quartz) melt at a lower temperature and are separated from other rock rich in iron/magnesium. As volcanoes erupt, the silica-rich rocks emerge on the surface first and are concentrated into continents (Africa, South America, Australia, etc.) that will keep growing larger as more crust is "fractionated" through melting. Think of these continents as Cheerios floating in a bowl of milk, bouncing together as the molten rock currents swirl below in the mantle beneath the crust. No Northern Virginia rocks are 4.5 billion years old, when the crust first formed. 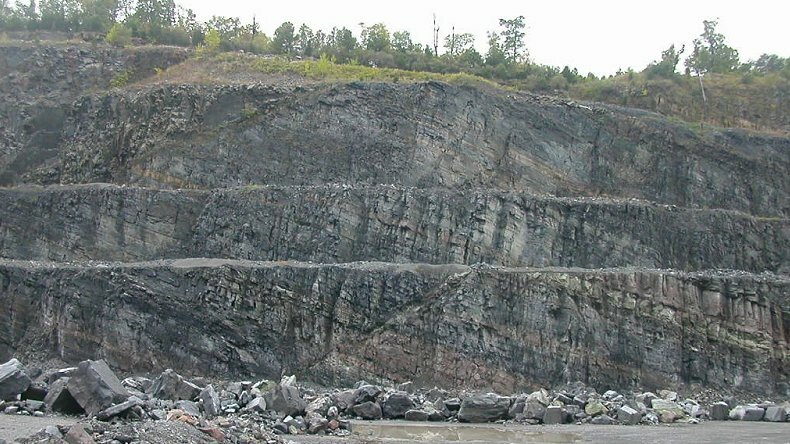 All of the rocks in Northern Virginia have been remelted and recycled through the subduction/melting/eruption process (or at least eroded and reconstituted as new sedimentary/metamorphic/igneous rocks) at least once. Our rocks in Northern Virginia have been remixed and remelted since the earth originally developed a hard rock crust. 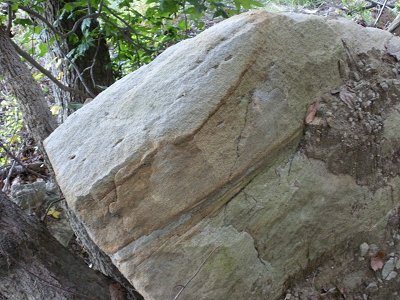 The oldest rocks in the Blue Ridge on the western edge of Northern Virginia are the Pedlar and Old Rag granites, about 1 billion years old. East of the Blue Ridge and north of the Rappahannock River, our oldest rocks cooled into their current solid form "only" about 450 million years ago.